Warning: I’m going to gush over this product. The following has to be one of the best gifts I’ve seen for a child in a long time. 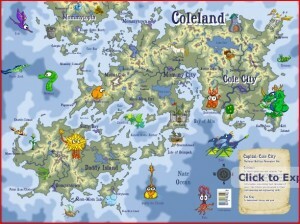 Kidlandia makes personalized maps for kids. I’m not talking about a run of the mill map. Make a map that outlines a world of fantasy with silly monsters and towns and forests named after your relatives. The entire thing is personalized and includes names and places of the people in your child’s life. I’ve never seen a more unique and fun way to include expanded family in an usual piece of artwork your kids will adore making and displaying on their wall. Both of my kids adore it – and Nate has been excited to share his new map with anyone who walks through the door. Plus, as most of the folks who do walk through our door have their own plot of “land” on his map, they have been flattered and excited to share it as well. We had a blast just personalizing it on the interactive tool on Kidlandia. Go ahead and check it out for yourself – sit down with your child and make one for your child – it’s free to make one. And if you find you want to go ahead and order one, use coupon code mommieswithstyle and receive 15% off your total purchase. Buy it and frame it yourself or have them stretch it over canvas. We’re in the process of creating another one for Nate’s little brother. Because it’s that cool, we have to have another one. « Philips AVENT BPA Free Insulated Cup: Give the Kid a Cold Drink!